Which five active British Boxers take the best shot? There are many British boxers who get criticized for their lack of punch resistance. Amir Khan and Enzo Maccarinelli are prime examples. But their are some British boxers out their, who take a punch better than most. I'll go through my list of 'Top Five Chins in British Boxing', and you let me know what you think. 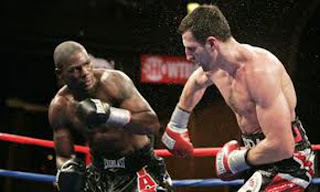 5) Ricky Burns - Burns has been down a few times in his career, but he has faced huge punchers like Roman Martinez and Michael Katsidis and never been stopped. He's known for having a lack of punching power, but he makes up for it in boxing skills, work-rate and ability to take a good punch. 4) Nathan Cleverly - Say what you want about Nathan Cleverly's run of opponents, but he has proved on more than one occasion that he knows how to fight. In the build up to his fight against Tony Bellew, many of you thought Cleverly would be in trouble if Bellew landed his big right hand on the button. Well Bellew did land his big right hand, twice, flush in the tenth round and Cleverly took them and carried on fighting. 3) Matthew Hatton - Matthew Hatton has been criticized for 'Going into Journeyman mode' in fights just to see the final bell. He might be guilty of this, but their's no denying that he took some bombs for twelve rounds against Kell Brook and Saul Alvarez. And taking into account the fact that Alvarez is much bigger than Hatton, his Top Three ranking is very worthy. 2) Dereck Chisora - Chisora, in my opinion, has one of the best chins in world boxing. He took a twelve round beating when he fought 'Dr Ironfist' Vitali Klitschko, a man who is known for his very high knock-out ratio. Chisora also took the best Robert Helenius had to offer. He got stopped in five by David Haye, but Haye is one of the hardest punchers in the sport, and it took him several flush power shots to finally put Chisora down. 1) Carl Froch - It should come to no real surprise that first on the list for the best chin in British Boxing is Carl Froch. Froch has never been stopped. And he has fought huge punchers like Lucian Bute, Glen Johnson, Mikkel Kessler and Arthur Abraham. Froch has only been down once in his entire career, and while he has underrated boxing skills, his 'Steel Chin' is his best asset. Johnny O'Hara: "Matthew Hatton! Ricky Burns! I'm out haha." Matt Bowes: "Rees, Matthew Hatton, Burns."